It’s been another giant milestone in life for myself and my family as we welcomed another new little life. Therefore, life as I knew it prior to his arrival, was put on the back burner. By “knew it,” I mean life that revolved, even loosely, around a schedule. I was able to make time for baking, blogging, work, children, family, etc. (notice house cleaning, cooking dinner, folding laundry, bathing dog, etc. were not listed). Then, much the same as the 1 day between my birthday and my brother’s, this little one decided to let me know he was on the way as we celebrated the birthday of his big sister. At 2:07 pm the very next day, it was time to bring out the lounge pants and brace for many nights that consist of 1 hour cat naps in between tending to this tiny 9lb. piece of perfection. The kicker? ANOTHER child with a dairy allergy which meant dairy free diet for mamma. Do you know what butter is? Dairy. Baking came to a halt due to my total ban on butter, milk, cheese…all things put on this planet to make me happy. What is the use in baking if you cannot sample (and sample, and sample, and sample some more) the product during and after? However, it is my albeit relatively “new” tradition to deliver something delicious each holiday to those friends that live nearby and this year was no exception. I needed something that was sweet, yummy and could be made in bulk! Lucky for me, I ran into a friend with an amazing recipe for this delightful, smooth and comforting sauce that is perfectly balanced with a peeeeeench of salt. I did a few trials with this recipe, tweaked a few things here and there, and whamo…I was ready for holiday preparation. There is a bonus to this treat… it is unbelievably versatile. Not only are there several different ways to make this, there are even more ways in which one might enjoy this goodness in a jar. Try different salts (Fleur de Sel, Pink Himalayan Salt, etc. ), add a splash of bourbon, etc. Maybe ditch the salt and go with the straight stuff. Cook it a little longer for a strong deep flavor, or a smidge less for a lighter and sweeter flavor. 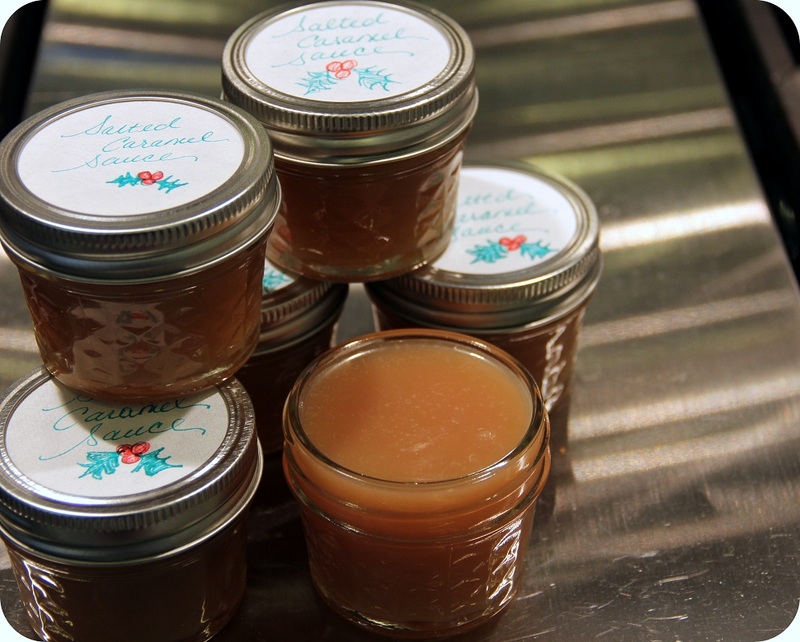 The overall theme here: Caramel sauce is incredibly easy to make and SO much better than the bottled stuff in aisle 5. 1. Slowly stir the water and granulated sugar over low/medium heat until sugar is dissolved. *Important… make sure you are stirring very slowly. You do not want any sugar crystals to make their way to the sides of the pot. They burn and can cause your sauce to be unpleasantly grainy. 2. Once the sugar is dissolved, increase the heat to medium/high and allow sugar to boil for approximately 12 minutes, until a nice amber color. * Important … Do not stir during this stage! Just walk away. Grab a glass of wine, doodle on a piece of mail, chip away at your new manicure. Whatever you need to do to keep yourself from stirring…do. This is where a thermometer comes in handy. I don’t trust my eye to know “amber” – So, let it boil until 350 degrees. 3. At 350 degrees, remove from heat and whisk in butter until dissolved. *Important… Butter will make boiled sugar bubble violently. It is best to have an oven mit on while you stir. 4. Once butter is incorporated, place the pot back on low heat and gradually add cream until incorporated. *Important… Again, cream will bubble violently. Hope you kept that oven mit on. 5. Add vanilla and salt. Whisk on low heat until smooth and all cream/vanilla/salt is thoroughly incorporated. The cream will have cooled the mixture down a bit. Stir on low heat until hot again and salt has dissolved in. 6. Once finished, place in glass jar or let cool to room temperature in sauce pot until you are ready to refrigerate. Refrigerate for 2-3 weeks. Rewarm before use.